Approximately 90% of job applicants submit their resume online, and most of those resumes are scanned by automated technology (applicant tracking systems or “ATS”). So how do you get your resume “accepted” by these screening tools instead of rejected? Follow the below tips to increase the likelihood of your resume passing the system’s check. Yes, this can be time consuming, but it is essential. If you want the screening tools to accept your resume as “qualified,” the tools must identify content in your resume that matches the requirements listed in the job for which you are applying. Every job is different, every company is different, so every resume should be different. Even small tweaks to keywords can make a big difference! Don’t copy and past the job duties from the posting into your resume. However, make sure the requirements from the posting are included, and NOT hidden, in your resume. Focus on those relevant skills, even if that means you have to remove less relevant experience to draw attention to the relevant skills. Most importantly, make sure your relevant experience is somewhere referenced on the first page of your resume! Review the job posting and make sure to use the same terminology in your resume as is used in the posting. Don’t go overboard but use the key words more than once. For example, instead of “recruiter”, use “talent acquisition specialist” or “talent manager” if that is the term used in the job posting. Instead of “business development”, use “sales” or “prospecting” if those terms are used in the job posting(s). You get the point! However, do NOT copy and paste exact verbiage from the job posting into your resume. This is a huge turn-off and even if it gets your resume through the screening tools, it won’t get past the first set of human eyes. Some fonts and formats are hard for screening technology to recognize or translate. Include a skills section or competencies section at the top of your resume. Some technology analyzes how recent experience is, so putting critical competencies at the top can help the technology identify it as more recent. Some technology only uses dates, not placement within the resume, so make sure your resume has dates and that relevant competencies and key words are included in the most recent jobs. For more tips on resume writing, interviewing, or job searching, follow us on Social Media. 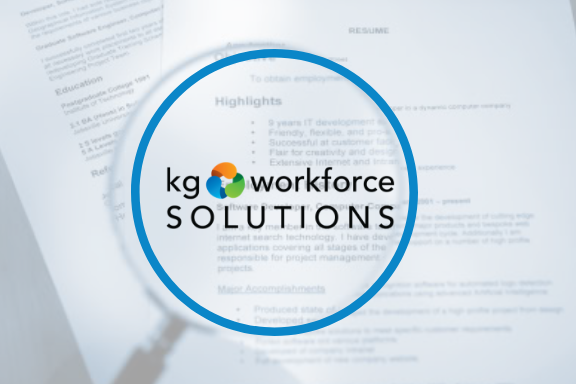 Need help writing your resume, contact us at resumes@kgworkforcesolutions.com. Happy Job Hunting!